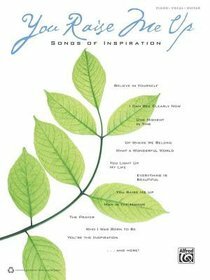 You Raise Me Up: Songs of Inspiration features dozens of songs that lift the spirit and provide a sense of optimism and hope to handle today's challenges. Arranged for piano/vocal, the songs range from country and pop to R&B and sacred hymns. Titles: Amazing Grace * Bridge Over Troubled Water * Everything Is Beautiful * From a Distance * Heal the World * (Your Love Keeps Lifting Me) Higher and Higher * I Can See Clearly Now * Lift Every Voice and Sing * The Morning After * Look to the Rainbow * Peace in the Valley * Shower the People * When You Believe * Up Where We Belong * What a Wonderful World * When You're Smiling * The Wind Beneath My Wings * and many more. About "You Raise Me Up (Music Book)"